The Ella Fitzgerald Centennial: Our 'First Lady Of Song' Her incredible technical abilities were self-evident, but in front of a microphone, she radiated pure joy. 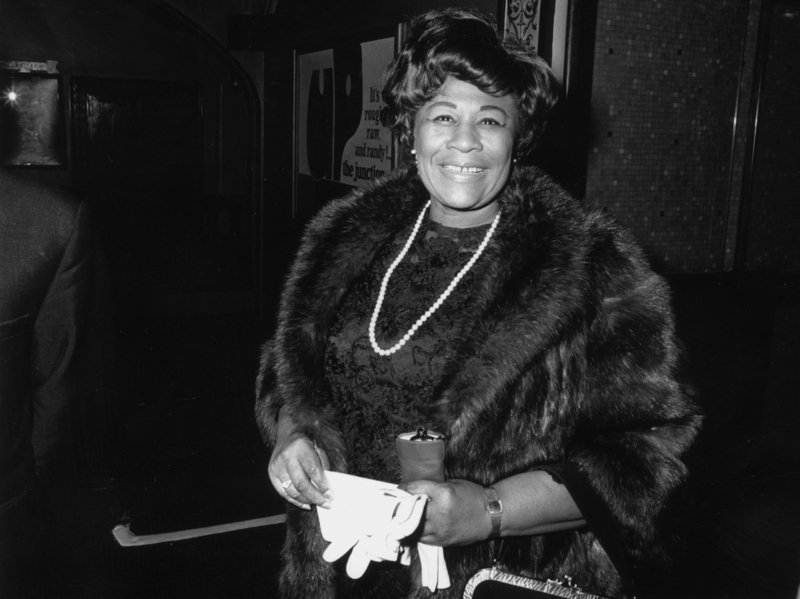 Jazz singer Ella Fitzgerald during a 1958 visit to London. Her voice is instantly recognizable. Her youthful exuberance, pure sound and positive energy just make you feel good. Her incredible technical abilities were self-evident, but when she sang, she radiated a joy consistent with her own character both on and off the bandstand. 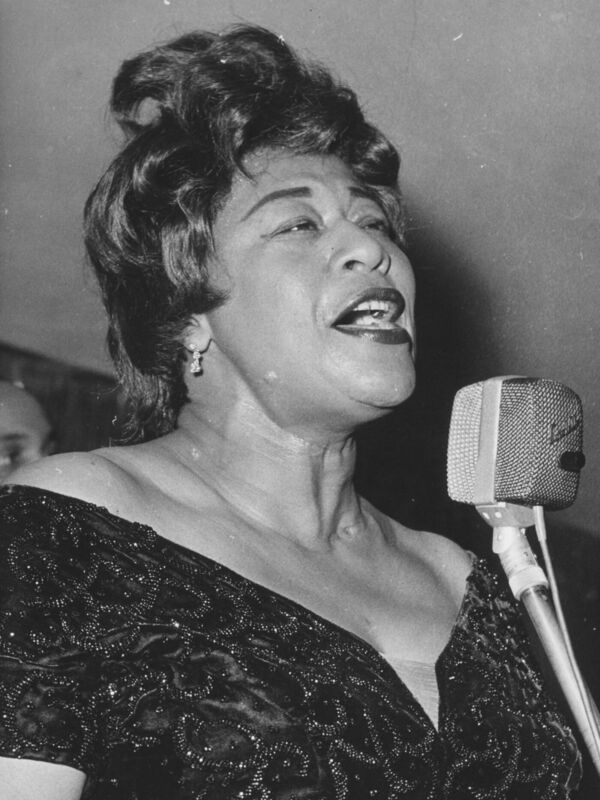 Ella Fitzgerald was the undisputed queen of jazz singing and American popular song. She demonstrated extraordinary talent as a young teen, winning an amateur singing contest at the famous Apollo Theater in Harlem. Initially, she was going to dance, but a case of stage fright inspired her to sing "Object of My Affection." Singer Ella Fitzgerald during her performance at the Bal Pare in the Hotel Bayerischer Hof, Munich. Soon after her Apollo Theater stint, drummer and bandleader Chick Webb asked the shy 16-year-old Fitzgerald to join his orchestra. At first, Webb was hesitant to bring her in because she didn't have the standard good looks of a singing diva. Luckily, Fitzgerald had a voice that no one could match. The Chick Webb Orchestra reigned supreme at New York City's Savoy Ballroom, also performing live on the city's numerous radio programs. He featured Fitzgerald on half of the selections, but after they hit it big in 1938 with the novelty smash "A-Tisket A-Tasket," Fitzgerald was never absent from the bandstand. Ella Fitzgerald's rare combination of confidence and innocence reflected the spirit of mid-20th century America. Despite her popularity, she never deviated from her commitment to jazz as an art form. She could improvise right next to saxophonists like Charlie Parker, Coleman Hawkins or Lester Young, then turn around and perform a classic American ballad while infusing it with her natural swing. One of the most important achievements in Fitzgerald's career was her Songbook series, produced by Norman Granz. These recordings confirmed her role as the premiere American female singer. The series included songs by Cole Porter, Irving Berlin, Duke Ellington and others. 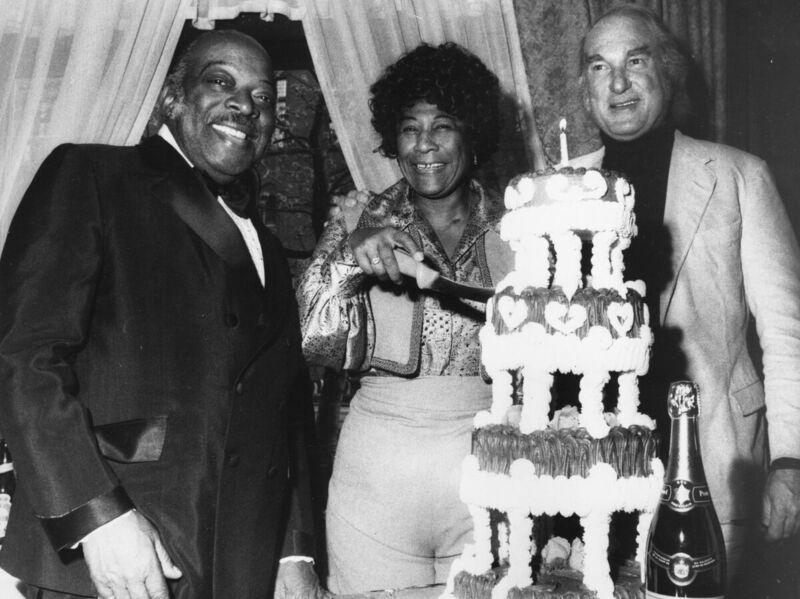 Jazz pianist and band leader William Basie, better known as Count Basie, with manager Norman Granz (right) to celebrate the 54th birthday of Ella Fitzgerald. After the Songbook series of the mid-'50s, Fitzgerald continued to perform throughout the world with top-notch musicians such as Duke Ellington, Oscar Peterson, Louis Armstrong, Count Basie, and Joe Pass. And she was a regular participant of Granz's famous Jazz At The Philharmonic. While Fitzgerald kept a grueling touring schedule, performing in front of millions of fans, she managed to keep her personal life private. Instead of painting the town after a long tour, she was known to just go home, read a book, and watch her favorite television soap operas. After a career of more than 60 years, she died quietly at home in Beverly Hills at 79 in 1996. Ella Fitzgerald will always be remembered as "The First Lady of Song."